Rethinking Reputational Risk explains the hidden factors which can both cause crises and tip an otherwise survivable crisis into a reputational disaster. It uses case studies such as BP’s Deepwater Horizon oil spill, Volkswagen’s emissions rigging scandal, Tesco, AIG, EADS Airbus A380, and Mid-Staffordshire NHS Hospital Trust. 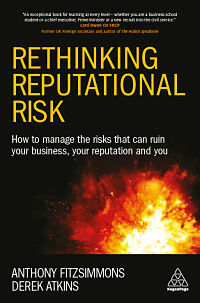 …Rethinking Reputational Risk lays bare the actions, inactions and local ‘states of normality’ that can lead to perception-changing consequences and gives readers the insight to recognize and respond to the risks to their reputations. From a review by Stefan Stern, Financial Times, 4 January 2017. While crises and accidents seem to erupt quickly, most take more than three years to emerge, the authors suggest. … Hierarchy may deter those who have noticed problems from coming forward, creating a ‘risk glass ceiling’ through which no bad news can penetrate. Bosses may have too high an opinion of themselves and their ability to spot trouble. To avoid groupthink, boards should make sure a devil’s advocate case is made to test assumptions… A “pre-mortem”, which tries to imagine how things could go wrong, may help avoid future difficulty. An exceptional book for learning at every level – whether you are a business school student or a chief executive; Prime Minister or a new recruit into the civil service. NOTE: Readers of this post can enjoy a discount at www.koganpage.com/reputational-risk by using this code: ABLRRR20. Please bear in mind this discount is time-limited.